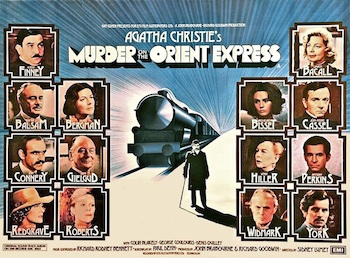 Book Vs Movie "Murder on the Orient Express"
The Margos put their detective hats on and get all old-timey in this new ep talking about the number one fiction author of all time Agatha Christie and the 1974 Sidney Lumet classic Murder on the Orient Express. So what are the similarities and differences between the original novel (published in 1934) and the film versions we watched? And which actor best captured Poirot in the Margos estimation? Her most famous character Hercule Poirot and the many actors who have played him over the years. How Lumet managed to capture that 30-minute ending (!) with so many pages of dialog and a small filming space. How PBS created their own version for Masterpiece Theater. The Kenneth Branagh adaptation in theaters as we tape this. Correction! The actor who plays Ratchett in the PBS version is Toby Jones! Want to meet the Margos? Come join us at the Podern Love convention in New Orleans!